I am unable to rate this game because I have not submitted my own entry but, if I could, i would rate it highly. I was kind of confused by this. I feel like if I hadn't read any of these comments I wouldn't have known that the fiddler thing was a puzzle, I thought it was a nightmare or something that the ghost was trying to have me remember. A couple of times the descriptions went off of the screen and my up button stopped working on the dialogue choices after a while. It seems like you had a plan though, a definite approach on how you wanted it to go. I think if you cleared some things up by adding some other images, or even an "objective"-type of message, it'd help a lot. Only made it half way through level 2, but everything about this game is very sweet. Really nice job! Sound is great, sets the mood perfectly. I had headphones in and when I saw that Baloo was dead it was one of the first times I saw one of the tiger saws and it revved it up at the same time, it was great. Really nice work. Like others have said, clue review screen was tough. I wasn't really sure what to do after I got all the clues. Do you piece them together and then it tells you where to go next? I think if you add some on-screen instructions for how to move the clues while you're in review mode, you can probably get away with it working the way it does. The morlocks looked sweet, I was into them. I'm kind of new to playing Twine games. This is probably only the second or third one I've played, but your game definitely has more art than I've seen in the others and I appreciate that. There's a lot you can say with text alone, but sometimes it's just nice to have a picture in there and I find it adds to my experience. Like some others have said, I enjoyed the water colors. I read the poem quick before playing this, and you seemed to hit the nail on the head. I also like the twist you added to the end making it about the creator of the hummingbird and not the actual hummingbird. I would have liked some hummingbird tweets or hummingbird fluttering noises -- I found it interesting that neither the original poem nor your game dealt with what the hummingbird sounds like. An eerie game. Those random footprints creeped me out. If you go on, I shall feel myself constrained to cut off your face. That horse animation is smooth. Very well-written. It felt good having the option to spurn somebody in-game. My main challenge will be figuring out what to do with all these characters. Also, text at this size is tough! 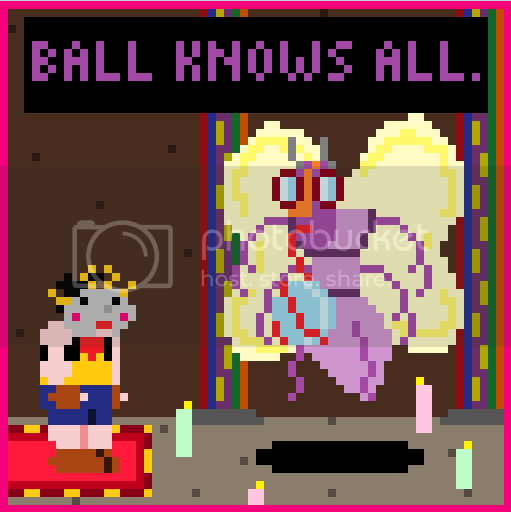 EDIT: It's a fortune teller bug man. He spins the ball with his tongue. 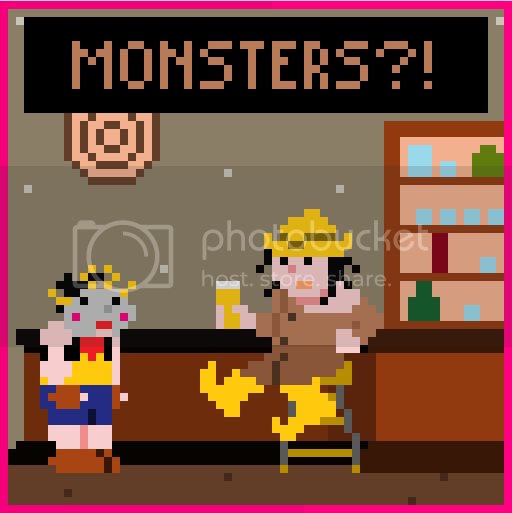 I put together 5 or 6 scenes like this with different characters. Hi, you can make the size of your game screen bigger by changing Viewport Dimensions on your game's edit page. Try something like 640x640. Right now it's really small in the browser. I really like what you're doing with the focus! The black and white does look great, but the color can open you up to a lot of different possibilities throughout the game. Actually some black and white elements in addition to color elements opens you up to a lot as well. Boy did I have to edit that a lot of times. 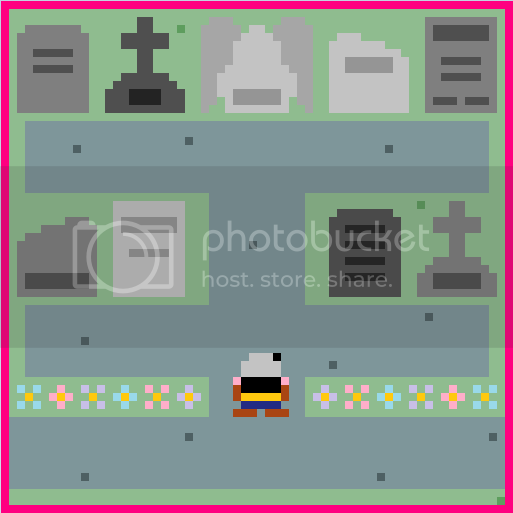 Messing with this graveyard that I hope to make work similarly to the lost woods. Thought it might be fun to have a spot where everybody can post a screenshot representative of the work they accomplished each day in the jam. Construct 2 is very easy to use. I've got a few examples .capx files here if you're interested.